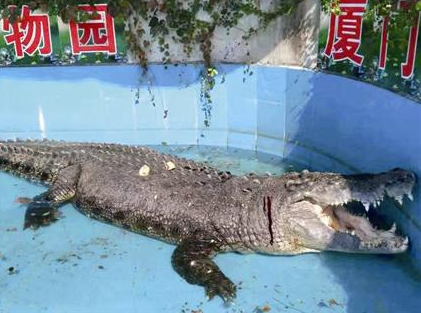 On October 31, Xiamen, Fujian Province, China, Asia’s largest crocodile nickname as “Xiaohe” was hit by a stone by a family tour group, causing head bleeding. The diameter of the stone reached 17 cm. The witnesses said that the stone thrower saw the “Xiao He” moving and then took pictures with laughing. After the stone thrower found the bleeding of crocodile then hurried away as avoiding to be caught by Zoo Keeper. It is known that the tourists often tease crocodiles with small stones and sticks in order to satisfy their curiosity. The head and claws of the “Xiao He” have wounds. A little child asked the adults at the scene: “does it not hurt?” Now the weather is getting cooler and the healing of crocodile wounds is slower. Although it has been treated and nursed urgently, the healing of crocodile wounds still needs not less than ten days. The zoo has been watching closely for 24 hours to the “Xiao He”, and at the same time has called the police to find the tourists who they are perpetrator. Tourists threw stones at crocodiles in the zoo on October 31, just to verify whether they were real or false, according to the director of Sino and Africa ShiYe Wildlife Park in Xiamen City, China. The crocodile bled because it was smashed to the head by the stone with 17cm. The killer of crocodiles is a family tour consisting of adults and children. They found a huge Asian Bay Crocodile immobile in the crocodile park, so they suspected that the crocodile was a model. In order to verify the truth, they picked up stones and threw them on the Bay crocodile. At first, when the stone was thrown on the crocodile, but there was no response, the family intensified their efforts. The crocodile was hurt and finally moved, and the family took pictures happily. When it was discovered that the head of the crocodile began to bleed, the whole family left quickly. The zoo official also said that when the family hit the crocodile with stones, the tourists around them also persuaded them, but the family ignored them and kept throwing stones at the crocodile.